Claire Hopkins, Jonathan Fishman, Robin Youngs, Edward Fisher, Musheer Hussain,	The Journal of Laryngology & Otology, Volume 131 Issue 12, pp 1033-1034. M Khan, K Conroy, K Ubayasiri, J Constable, M E Smith, R J Williams, I Kuhn, M Smith, C Philpott,	The Journal of Laryngology & Otology, Volume 131 Issue 12, pp 1035-1055. R W J Mcleod, A Price, R J Williams, M E Smith, M Smith, D Owens,	The Journal of Laryngology & Otology, Volume 131 Issue 12, pp 1056-1064. I Z Iqbal, G H Jones, N Dawe, C Mamais, M E Smith, R J Williams, I Kuhn, S Carrie,	The Journal of Laryngology & Otology, Volume 131 Issue 12, pp 1065-1092. A Williams, A Biffen, N Pilkington, L Arrick, R J Williams, M E Smith, M Smith, J Birchall,	The Journal of Laryngology & Otology, Volume 131 Issue 12, pp 1093-1107. C Swords, A Patel, M E Smith, R J Williams, I Kuhn, C Hopkins,	The Journal of Laryngology & Otology, Volume 131 Issue 12, pp 1108-1130. The Journal of Laryngology & Otology, Volume 131 Issue 12, pp 1131-1141. The Journal of Laryngology & Otology, Volume 131 Issue 12, pp 1142-1156. 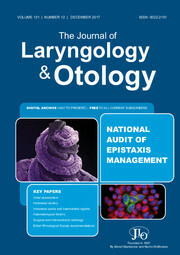 The Journal of Laryngology & Otology, Volume 131 Issue 12, pp -.